Quit complaining. Good B level anime. What is surprising to me is that there are like 16 pages of people who hate this anime. If it was so bad, why did you watch it, then take the time to post a review? The first episode was alright but I expected it to get better throughout but in each episode it just got worse. The idea of the show may sound cool but other fantasy anime have done it a whole lot better. I found the character to be bland and just not exciting in the slightest. in my opinion, enjoyment is the most important factor in what makes a show great. "oh im sorry, just kidding i tricked you" and "girl jump in front of the person trying to save her"
it was kinda boring but i got some enjoyment out of it. i'll list it after all of the things i didn't like. wait never mind. i don't know why i liked this anime. I was all for this anime. Magicians and high school usually are right up my alley. I didn't even mind this was only one season... until I got to the second half. I have never been left so confused by any ending the way I was with this one...... I hate to say any anime is a waste of time, but this one is pretty close. I discovered this anime using the random feature and I gotta say, i'm kind of at a loss for words. Now don't get me wrong, there were parts of this show that I really enjoyed. I liked the characters and the idea surrounding the show, being that they get brought to a whole second world to practice and learn a bunch of magic. The first couple episodes were strong as well. However, it was all down hill from there. I found most of the episodes to be random and the dialogue/script to be pretty cliche and predictable. My main gripe with this show however was the ending. It will leave you wondering what the hell you just got done watching. There's no explanation and it leaves you on a giant cliff hanger (if you can even call it that). Rather disappointing seeing as they had a really cool idea and some pretty neat characters to go off of. If you have nothing better to watch then i'd say go for it, otherwise there are better shows out there. The beginning was good, but from there, it was downhill. Whoever wrote this has no clue what they are doing. You waste most of your day watching until episode 10 where actual background info is given. However, It is a 2 minute flashback and gives no help to the already broken plot. When you get to Episode 12, the anime is absolutely crushed by terrible dialog and a confusing ending for those not paying attention to every detail of the anime. Overall, this anime is pretty much trash. Have fun watching it. the first 11 episodes were good but the last episode left me confused and not understanding the seemingly huge time jump. i was left wondering what even happened between 11 and 12 or like i missed a question but given an answer. otherwise if the anime had a complete first season i would recommend it but as it stands i can only ask why they didnt atleast leave with a cliffhanger rather than make episode 11 seem pointless make me feel like i skipped multiple episodes. Why everybody who gave this a 2 or 1 star is stupid. This anime was really good. I do not understand how most of the people who wrote a review cannot follow the plot. The entire plot was how a kid wanted to escape his normal life and when it happened he got thrown into a world of war and magic. Plus if you don't know how to follow time travel..WHY are you watching this? Ever seen a show where there is a much better plot going on in the background and you are left wondering why we aren't watching that one? That is Magical Warfare. 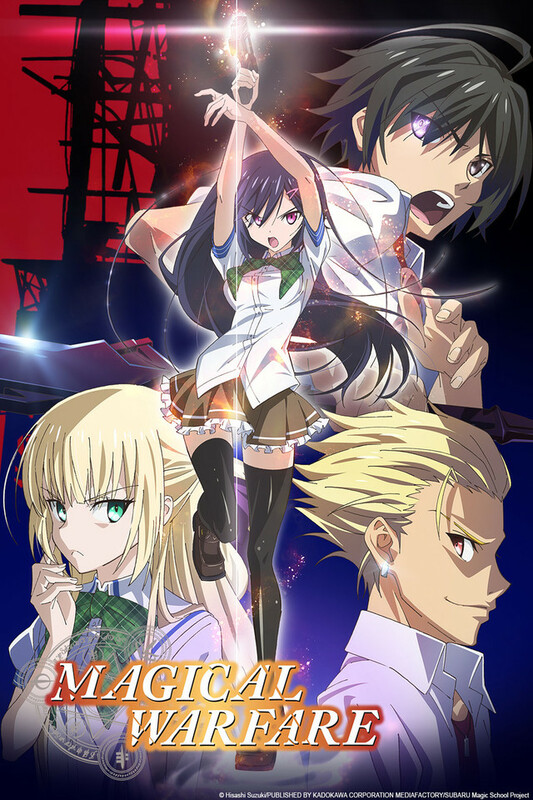 In Magical Warfare there is a war being waged between two groups of wizards: one that wants to rule the world and the other that wants to live separate from the human world but is into some shady tactics so I am hesitant to outright call them good guys. Into this setting ripe with storytelling possibilities what plot do we go with? A generic high school love triangle between characters with less personality than a pile of gravel. And the series knows it too because the last act kicks off with a dragon coming in and burning the high school to the ground to put an end to the going nowhere fast love triangle plot. Meanwhile there is a magical war going on in the background with some mildly interesting characters that could have appeared as enemies in Fairy Tail filler episodes. But the characters we do follow are all generic and bland as can be. The main character has the character trait of being heroic and nice and that's it. His girlfriend can get jealous. His friend has the personality trait of standing in the background. And the female lead has the personality trait of running off on her own and getting captured. And that love triangle goes nowhere. And it goes nowhere fast. It speeds by what should be important and more interesting plot points so it can get to more pointless dithering. Bad guy sneaks into hero's room to deliver him a warning about the good guys? Not important! We need to get to Mui bringing him chocolates and his girlfriend getting jealous. That is what is really interesting! But the worst part of this series is the ending. There is an epic battle about to happen and suddenly the hero is sent into the past about 20 years. He eavesdrops on some of the more interesting supporting characters before sitting down on a bench. And then the series ends. No resolutions...no epic showdown...just bench and done. So there is not even a payoff to this wreck of an anime. My advice is watch this with friends and just make fun of it. To all those who want to give this show a shot PLEASE be warned you will be disappointed with the ending and that's no joke. At first this was a nice little anime to watch along side the ones I was already watching that season. It was nothing grand or amazing just a regular, entertaining anime with cute girls and magic with a bit of fan-service on the side, with a dash of minor character development. Sooo yeah just regular average anime that was fun to watch... until the last couple of episodes happened. Here's the deal I think it was episode 10, things were heating up and a girl who is close to the male protag was kidnapped by so antagonist looking guy. So protag goes out to rescue said girl, so its all singing and dancing so far. However as the episode draws to a close, the antagonist looking guy was about to tell an important piece information, regarding the main character to the kidnapped girl and then it ends giving a cliff hanger. Ok so I was pretty hyped so far I was quite interested in what it could be as I had a few ideas. Next episode airs out.... WTF where was the plot it just opens up with a huge confrontation out of nowhere no explanation what so ever and then ends on the last episode with what seems to be another cliffhanger and no season 2 in sight. Because of these last 2 episodes or episode (I cant remember if I'm going to be honest) just made this anime the worst anime I have ever watched period. So please watch this with fair warning disappointment lies at the end.